Hal Kemp (March 27, 1904 – December 21, 1940) was a jazz alto saxophonist, clarinetist, bandleader, composer, and arranger. He was born in Marion, Alabama. His major recordings were “Got A Date With An Angel”, “Heart Of Stone”, “Lamplight”, “The Music Goes ‘Round And Around”, “You’re The Top”, “Bolero”, “Gloomy Sunday”, “Lullaby Of Broadway”, and many others. At the University of North Carolina at Chapel Hill he formed his own campus jazz group, the Carolina Club Orchestra. 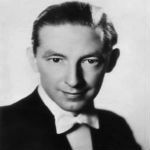 This first group toured Europe in the summer of 1924 under the sponsorship of popular bandleader Paul Specht. Kemp returned to UNC in 1925 and put together a new edition of the Carolina Club Orchestra, featuring classmates and future stars John Scott Trotter, Saxie Dowell, and Skinnay Ennis. Kemp once again toured Europe in the summer of 1930.